The shockwave of those two films was so powerful it lasted for decades, and the fallout is still with us today in the form of anime marketing, journalism and merchandising. 1979 didn’t include a Yamato feature film, but the rest of the anime world was in a period of explosive growth. “Yamato Fever” brought renewed interest to SF TV classics like Cyborg 009 and Gatchaman and a revolutionary new series called Mobile Suit Gundam. Movie screens were lit up with Galaxy Express 999, Cagliostro Castle, and more. Yoshinobu Nishizaki himself expanded his projects to include a Triton of the Sea compilation film and a new series called Space Carrier Blue Noah. Of course, he also produced The New Voyage that year, grabbing huge TV ratings and pioneering a new format called a “telefeature.” As if that wasn’t enough, he also kept tabs on the production of Star Blazers in America and developed yet another series based on the children’s story The Blue Bird by Maurice Maeterlinck. But his next Yamato project was never far from his mind; The New Voyage had set several new plot points in motion, and fans were eager to see what would happen to the beloved Yamato crew next. “Yamato Part 3″ had previously been used as the working title of The New Voyage, and its useage continued into the latter half of 1979. It was invoked again when the first official mention of “the Next Yamato” appeared in issue 12 of the Yamato Fan Club Magazine, published in September/October. Space Battleship Yamato Part III in Production? As long as there is a theme that should be presented, I will make Yamato. It is already five years since the first voyage of Yamato…I have continued to fly the ship with the consistent theme of love. Whenever I have an opportunity, I talk about the theme of “love” and think about the mystery of life. Kodai fought to save the Earth in the first Yamato and fought for the peace of space in Farewell to Yamato. Many lives are needed to continue preserving space. All life is equal and has the right to live in peace and love. And even if the body is lost, I don’t think life can ever perish. Does Yamato go on a mission at any time and fight for any cause? I thought that we should talk about that, and therefore it was possible to make The New Voyage. Besides the theme described above, The New Voyage was also about bringing Yamato “back to basics.” It was a fun space opera with unparalleled grandeur. I wanted to regain the image of a battleship flying into space, which evolved into Space Battleship Yamato. A mountain of letters were sent to me, the one who thought about parting with Yamato after Farewell. These letters from Yamato fans told me that Yamato was not mine alone, but belonged to the whole country. Certainly, Yamato seems to have left my hand and gradually become independent. The New Voyage was not merely an “extra chapter” made to meet the expectation of the fans. Therefore, I will make a new 2-hour Yamato Telefeature. Though there is no story yet to be announced, it will be as great as anime for the movie theater. There are some among you who think Yamato should have ended with Farewell, and certainly I myself intended it to be the end. However, there are themes to be expressed and a lot of people hope to see it again, so I think Yamato should make another appearance. It is not only for the people who watched from the beginning, nor is it for my sake. It is also for the young generation that wants to know Yamato anew. Those who were junior high students at the time of the first work will soon be a university student or a member of society, and other young people will follow them in growing up. I would be very happy if they share a common memory of Space Battleship Yamato in the time of their youth. As we all know in hindsight, the next Yamato story would not be relegated to television. It would, in fact, become the most ambitious big-screen anime blockbuster of its day, breaking new technical ground in addition to enlarging the scope of the saga. But those strides were still several months in the future at the time the above words were written. The first step was to create a story, and the business of that officially got underway when Nishizaki met privately with Leiji Matsumoto on October 23, 1979 in a plot meeting to decide on their mutual goals for Yamato Part III. Together, they developed a list of ideas for the story that took note of where they’d been in order to figure out where they should go. In deciding on what sort of characters should take center stage, they immediately agreed that Sasha, the Iscandarian infant from The New Voyage, should be prominently featured as a young woman of about 17. The dilemma that followed was how such a stretch of time would affect the characters everyone wanted to see again. With Sasha approaching the age of 20, they would all be over 40 and no longer as appealing to a young audience. Thus it was thought that other young characters would be needed and the concept of a second-generation crew was born. These notes were subjected to a brainstorming session with key staff members on November 10. Since Nishizaki’s time was in high demand on Blue Noah (which had premiered on the Yomiuri network just ten days before the plot meeting) and The Blue Bird (which would launch in January), Leiji Matsumoto took the reigns from there and began writing the first story draft. 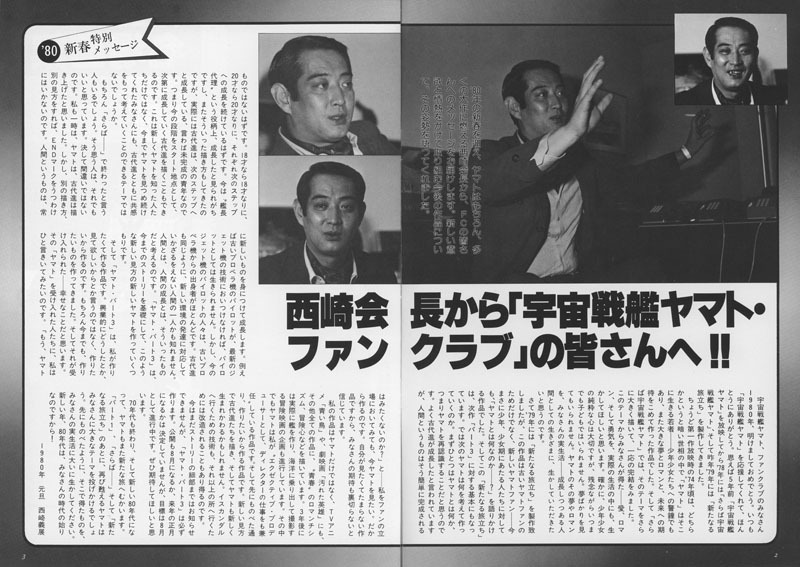 During that time, Nishizaki’s next message about the project was published in Yamato Fan Club Magazine #13, the last issue of 1979. It was now customary for him to enliven his personal essays with enthusiasm, bombast, and grandiose schemes, and this one didn’t disappoint. Thank you so much for supporting Space Battleship Yamato. Yamato was first broadcast five years ago, Farewell to Yamato was done in 1978 and The New Voyage was produced last year in 1979. The first series aired in 1974 during a time when social conditions were dark for young people. Yamato was a signal to boys and girls. In addition, it was the stuff of dreams, romance, and great expectations for the future. The theme was further enlarged in Farewell, which was a tentative conclusion. Everyone was touched by this theme. Love, romance, and courage to live your life to the fullest. A pure heart is indeed important to boys and girls, but we cannot be children forever. Yamato is more than a solitary dream; the romance of Yamato touches the real lives of everyone who is growing up, and I want you to make the most of it. When I produced The New Voyage in 1979, it was not only for the old Yamato fans. It was also made for the new ones, the boys and girls who ask, “what is Yamato?” today. The New Voyage has become the basis for the next project, “Part 3.” Then I have to think, what will the next Yamato be? First, what is Yamato? In other words, Yamato can be rediscovered. Though it is said that Kodai has grown up well, it is not so easy for a human being to be “completed.” After one grows from 18 to 20 years old, then the age of 20 should continue their growth to the next step. The speculation is that Kodai grew into the role of Captain, but even though he is presented that way, he is actually an incomplete young person so to speak, growing into the next phase of his life. That is the starting point for the current stage, and Kodai’s growth can go on. I think that both the new fans and those who watched Yamato from the beginning can still empathize with him. Of course, there are some who said it should have ended with Farewell. People who feel this way still think it is a good thing, so it is not a mistake at all. Even I thought Kodai’s story was finished at one time, but if you look at it from a different viewpoint, it can never be finished. Human beings will always grow and change. For example, consider the pilot of an old propeller-driven plane; if he can’t keep up with the latest in jet technology, it isn’t possible to live on as a pilot. However, most pilots of jet aircraft once flew propeller aircraft. Kodai is the same way. He might be a man who is forced to develop by a corresponding change in his environment. Growth is a function of being human. I intend to make this the viewpoint of the new story we’re going to make for Yamato Part 3. And it is a work I want to make. I won’t say it’s because I want you to see it, or to do good business at the box office, but simply because I want to make it. Of course, up until now, I have made what I wanted to make, and I’m grateful that it was accepted. When I ask those who accepted Yamato, or even myself from the standpoint of a fan, we all want to see Yamato. Therefore, I’ll make it. Because I myself am dying to see it, I believe I will not betray your expectations. In Yamato, the TV anime The Blue Bird, the film drama Dirty Hero, and my other works, the adventure and romance of youth are presented. Planning is also underway to build an actual battleship in three years and jump into the filming of an ocean adventure. As I said earlier, it is a work I will make because I want to. We’ll show Kodai from a new viewpoint and a new Yamato might be born. The technology to go to Iscandar could be modified to go even further. Though the story details cannot be told yet, Yamato Part 3 will definitely be made. It has not yet been decided if it will premiere in August or the next New Year’s holiday, but we are progressing with August as our goal. I would like you to look forward to it. The 70s are over, and in the new 80s, Yamato faces a new journey as well. After Part 1, Farewell, and The New Voyage, Yamato will revive once again with a big theme for everyone. As I said before, everyone please make the most of your real life. The new year and the 1980s are a new beginning for all of you! Over and above the philosophies about growth (as valid a justification as any to keep Yamato going) this message had a few other tidbits that are still interesting to unpack over thirty years later. The Blue Bird made it to Japanese television in January 1980 and ran for 26 episodes, roughly paralleling Be Forever‘s production all the way through. However, he did successfully produce a bike racing/teen romance film called Passenger, which was released in 1987. It included a score by Yamato alumnus Kentaro Haneda. Largely forgotten now, it only got as far as a VHS release afterward. Lastly, the plans to build a real battleship for a live-action “ocean adventure” probably didn’t go far beyond wishful thinking, since nothing of the kind was ever announced again. This may have planted the seed for perennial talk of adapting Yamato for live-action all the way into the early 90s, when this idea too was dropped (to be finally picked up by someone else in 2009, that is). To read a more detailed record of ambitious but unrealized Nishizaki projects, click here. Returning to 1979, there was one more big thing to happen with “Yamato Part III” before the year ended: Leiji Matsumoto completed the first story draft. He delivered it on December 31 and set the stage for the single biggest year in Yamato history.